Happy 2015 everybody! Whaddya say we start the new year off with some macarons?! 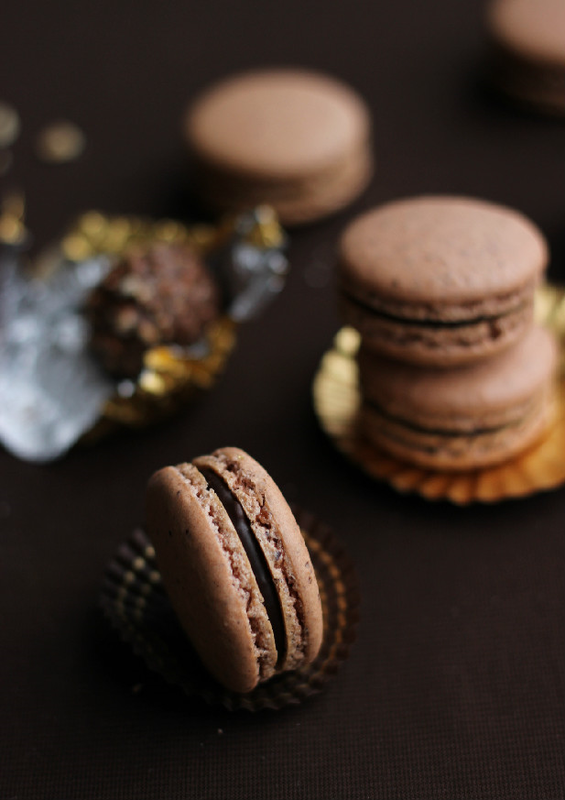 I think you'd all be pretty happy with that decision considering three of my top ten recipes of 2014 were none other than macarons themselves! Lucky for you guys, I'm starting to get more comfortable making them. They're still a pain in the neck when they want to be, but practice makes perfect! 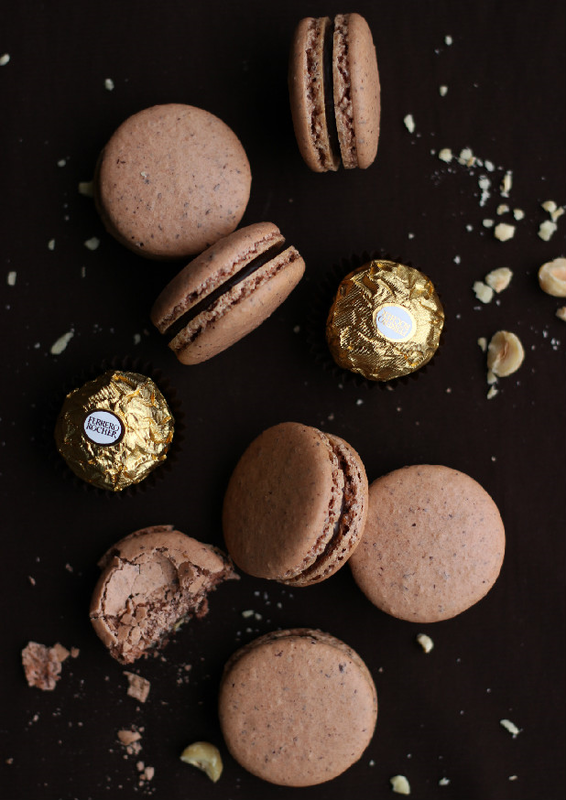 And these Ferrero Rocher macarons are darn near flawless! I made the macaron shell entirely out of hazelnut flour, with a touch of cocoa powder in the mix. And let me tell you, the shells alone were delicious. You can't really say that for entirely almond based shells because almonds don't taste like much and the amount of sugar in the shells usually overpowers everything. But these, these were amazing alone. But all macaron shells must be filled, so I whipped up a chocolate ganache and mixed in some chopped toasted hazelnuts. The end result was glorious, as you probably suspected. Add hazelnut flour, powdered sugar, and cocoa powder to the bowl of a food processor. Pulse a few times to combine and break apart any big lumps. Sift mixture into a clean bowl. Discard any large pieces that do not pass through the sieve. In the bowl of a stand mixer fitted with a whisk attachment, beat egg whites, sugar, and brown gel paste on low speed for 3 minutes, medium speed for 3 minutes, then high speed for 3 minutes. The beaten egg whites should stick to the whisk when you remove it. Tap the whisk against the side of the bowl to release them into the bowl. Pour the dry ingredients into the bowl with the egg whites. Using a spatula, fold the dry ingredients into the egg whites, until the batter is smooth and lava-like. Be careful not to overmix. The batter should slowly fall off your spatula when you pick it up and any peaks in the batter should settle down within 20 seconds. Transfer batter to a piping bag fitted with a large round tip. Line two baking sheets with parchment paper or silicone mat. Pipe 1.5 inch rounds onto the parchment paper(or silicone mat). It is helpful to use a guide here, so all your macarons are the same size. Once all the rounds are piped out, slam the baking sheet against a flat stable surface, then rotate, and slam again. This is done to force any large air bubbles to the surface. Let the piped macarons dry on the countertop for 60-90 minutes. The macarons are properly dried when you touch the top of the mounds and the batter doesn't stick to your finger. Preheat oven to 300 degrees F. Place the baking sheet with piped macarons on an empty baking sheet and bake on the middle rack for 20-22 minutes. Oven temperature varies, so keep an eye on them. To check if they are done, touch the top of the macaron. If it wobbles, it's not done yet. Let cool completely on baking sheet before removing. To prepare the ganache, place the chocolate chips in a small bowl. Heat heavy cream in a medium saucepan until simmering, then pour the hot cream over the chocolate chips. Let stand for one minute, then stir together until all the chocolate chips are melted and mixture is smooth. Stir in chopped hazelnuts. Let ganache sit at room temperature until it thickens to piping consistency. You can pop it in the fridge to speed up the process, but keep an eye on it. 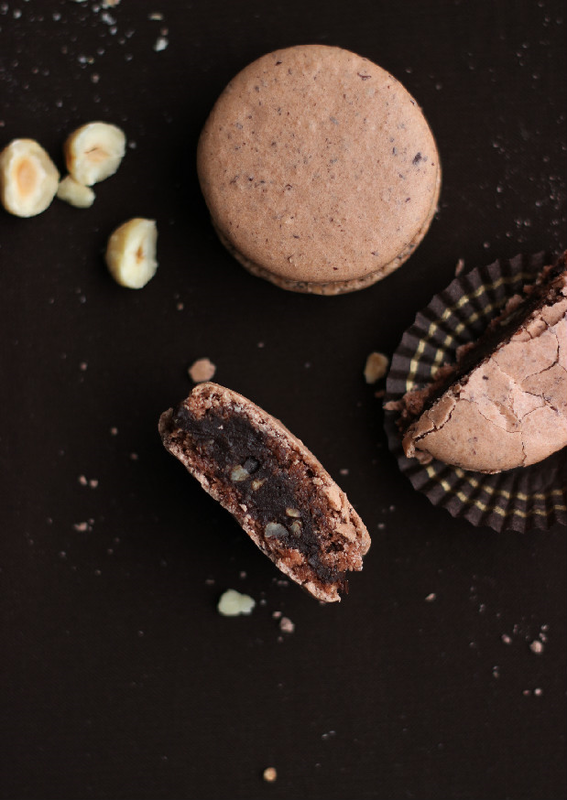 To assemble the macarons, match macaron shells into pairs of similar sizes as best as you can. Spoon ganache into a piping bag fitted with a small round decorating tip. Pipe a dollop of ganache onto the center of half the macaron shells. Top them with opposite shells. Refrigerate in an airtight container for 24 hours to let the flavors develop. Bring to room temperature before serving. Notes: I used a KA stand mixer and the low, medium, and high speeds correspond to speeds 4, 6, and 8 on the mixer.